Every product must have an initial price set in the basic settings of a product. These pricing options allow you to extend this area of your product with several options. Previous price allows the display of a crossed out price next to the current price. $149.99 but now a product is $129.99 is a common marketing tactic. 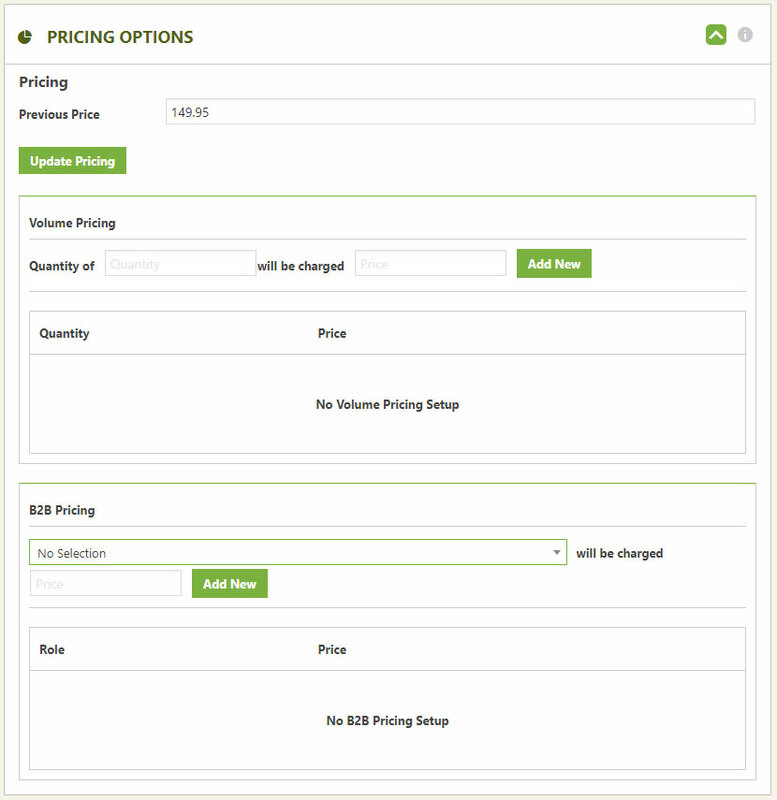 Volume pricing allows you to set tiered pricing for the product. For example, if a user purchases 1 item, it costs $20 dollars. If they purchase 5 or more, they get the price for $18 dollars. If they purchase 10 or more, they get the price for $15 dollars, etc. Business to Business (B2B) pricing allows you to setup different pricing for different user groups. First, you setup a user role such as wholesaler or business X. Learn more by clicking here about User Roles. Once you setup a User Role, you can visit this location and give this special user group a different pricing. Now, when a user in that User Role logs into EasyCart and shops, they will be given this special pricing IF it exists. If a product does not offer User Role pricing, they are given the normal list pricing of the product.